Nearly a decade back, Renault pleasantly surprised car buyers with the Duster. A butch, ready-for-abuse SUV wrapped in a city-friendly package seemed perfect for our roads. Since then, not only have other manufacturers jumped in, offering more choices, but the segment as a whole is about polish, and finesse now. And, we’d blame Hyundai for that. The Creta brought with it an appealing design, fantastic build and a plethora of features to ensure we felt it was “paisa vasool”. The S-Cross though had a rocky start and that lovable 1.6-litre diesel engine barely found any takers. Fast forward to 2018, the Duster is on the verge of bowing out. We now have the Captur that wants to take over the mantle, and promises some extra pizzazz along with the same indestructible vibe. The S-Cross has had a makeover and doesn’t have the punchy 1.6 anymore, and the Creta, well, it’s got a ‘beat me if you can’ attitude now, brimming with goodies. We spent the better part of a week driving these three together, in their top-spec diesel manual avatars, to figure out which makes for the jack of all trades, and if there’s a master of none. Buckle up! When the Captur first showed up at my doorstep, I was quite taken aback at the sheer size. Even though our test car isn’t finished in the Govinda-approved shade of sparkly orange, the Renault did seem to tower over most of the other cars in my apartment’s parking. And, it can play the bully card when you compare it to the other two too. It’s the longest and the widest in this company, and also boasts of the longest wheelbase. There are some appreciable elements that tie up the design quite nicely too - the full-LED headlamps (with dynamic turn indicators, no less! ), the swell-looking 17-inch alloy wheels, and that sharp-looking chrome insert on the side. But, it’s no SUV you may argue. Well, yes. It’s more of a beefy crossover. And that, the S-Cross isn’t. It’s more traditional in its design and looks more like a hopped up big hatch than a pukka crossover. It’s not winning any design awards for sure, and neither does it turn heads. But, it’s rather likeable with its upright face and those eye-brow like daytime running lamps. The rest of the design is practically unchanged since we first saw it three years ago, save for the LED tail lamps, a fresher design for the 16-inch alloy wheels, and the tiny hybrid badge on the boot. But, it’s no SUV you may argue. Nope, not even close. The Creta, in comparison, has the “how to look like an SUV” recipe down pat. The face is wide, the bonnet is set high, and it’s tall. Just right. We do think Hyundai could’ve added some more funk with the update, though. The headlamps get new detailing, but it should’ve featured LED lighting. The taillamps too, look a bit blah. We like the new 17-inch alloy wheels, though. All three cars seem large enough to be proper five-seaters, at least from the outside. In truth though, only one is. And that, surprise surprise is the S-Cross. That’s a proper lesson in why exterior dimensions don’t really mean much in terms of space on the inside. Let’s start from the back. The Creta has the narrowest cabin here, a trait we’ve seen with most new-age Hyundais. In fact, it’s slightly narrower than the Verna, that isn’t particularly accommodating for three occupants at the rear. Renault’s Captur does offer more width, but it compromises (rather heavily) on knee room. Also, since the seat base is the narrowest, there isn’t much real estate there to park your bottom on. It makes you feel a bit hemmed in. If you’re looking at seating four, not five, we’d suggest you pick the Creta over the Captur. There’s some more knee room to play with, and there’s a whole lot more headroom. Like we said, the S-Cross is a proper surprise package here. If space for five is something you absolutely can’t compromise with, the Maruti is pretty much your only choice. Yes, maximum knee room is a smidge less compared to the Creta, but it’s the minimum knee room figure here that matters. That’s a full 60mm extra compared to the Hyundai, and 35mm more compared to the Captur. It also has the longer and wider seat squab that ensures adequate support for your thighs. 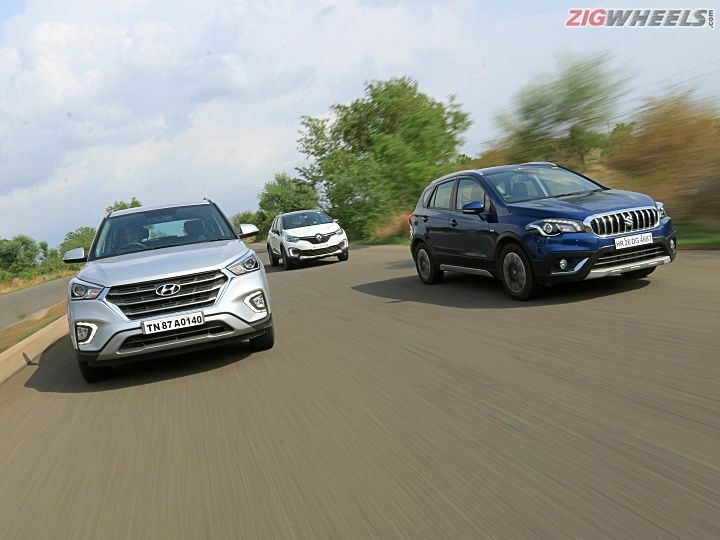 Up front, the Creta and the S-Cross are quite close when it comes to width. In the Captur, you’re left wondering where all that exterior width disappeared. What the Renault does give you, is the high seating position that lets you tower over traffic (heads up, those over 6ft might feel they’re a bit too close to the roof). The Creta too delivers on this front, and it’s the S-Cross that feels the most car-like from the driver’s seat. All three cars offer a whole lot of features for you to go bragging about. Bits like keyless entry, push-button start, cruise control, a reverse camera, parking sensors and leatherette upholstery are on offer on the top-spec models of every vehicle here. But, all of them offer significantly different cabin experiences. The Captur’s idea of pampering includes tough love. You start appreciating it after you’ve spent some time with it. All three feature leather upholstery, but the quality feels plush in the Captur and the quilt looks wow! Then there’s the solid thud with which the door closes, neither the Creta or the S-Cross comes close to that. Smaller details include the all-LED interior lighting, the splash of colour on the side AC vents and the soft ambient light for the climate control interface. But, save for these, the cabin doesn’t feel particularly premium. The quality of plastics feel industrial in a few places and doesn’t ooze the top-shelf feel Renault is billing it to have. The same holds true for the S-Cross as well. Save for the stitched portion on the dash (that now has a smoother texture), there’s practically nothing in the cabin that feels wow. It’s a simple straight-cut design that clearly favours functions over form. Also, while we’re discussing quality we’re still scratching our heads as to why Maruti insists on using power windows switches that are older than the original SX4. They work, but they feel so, so out of place. Also, the cabin doesn’t have anything extraordinary that distinguishes it from say, a Baleno. Where’s the secret sauce, Maruti? Not to say Hyundai has gone all out in making the cabin experience luxurious. But, the build quality feels consistent throughout, and the feel-good features that were added with the update, make you feel...uh, good! The smooth leather on the steering wheel, the positive action of the buttons for the touchscreen and the AC, and even the power window switches feel so nice to use. It’s the only one here to feature a powered driver’s seat, a wearable key, wireless charging and how can we forget, a sunroof. Now, the sunroof is a bit of a gimmick - not something you’d use daily, but the rest, definitely add to the usability of the Creta. Now, all three feature a 7.0-inch touchscreen on the dash. But, it’s only the Maruti and the Hyundai that support Android Auto, Apple CarPlay and MirrorLink. The Captur gets none of that, and the user experience in the Renault feels a bit underwhelming too. The colours seem washed out, and the general interface isn’t as slick as the other two here. Also, the graphics and the unit itself looks identical to the one on a 5 lakh rupee Kwid. We aren’t sure how many buyers are going to be kicked about that. If we had to pick the best of the lot, it’d be the Creta’s infotainment system. It’s slicker to use compared to the Maruti’s, and just that one bit quicker as far as start up and connectivity goes. If you pick the Creta’s top-spec SX (O) variant, you get a total of six airbags. All other variants (including the top-spec automatics) get just two. Other safety tech includes Hill Assist and ESC, which again are limited to the top-spec variant. We won’t blame you if you’re wondering why only the automatic versions of the Creta get ISOFIX child seat mounts. We’re as befuddled as you are. The S-Cross, on the other hand, offers all that it has to (safety-wise) right from the base-spec variant. Not that it’s a particularly expansive feature list to begin with, though. Whether you buy the base model or the top-spec Alpha, you get dual airbags, four-wheel disc brakes, ABS and ISOFIX child seat mounts. The Captur, in its Platine variant, gets you four airbags, anti-lock brakes, ISOFIX mounts and some safety tech like hill assist and ESC. If you pick any other variant, you get dual airbags and anti-lock brakes only. So, unless you’re only eyeing the top model, the vehicles seem to be on par as far as safety equipment is concerned. All manufacturers have stuck to their most tried-and-tested engines for the midsize SUVs/crossovers. Maruti Suzuki is banking on their “I can’t believe they’re still using this” 1.3-litre DDiS200 motor, Renault has the versatile (and virtually indestructible) 1.5-litre dCi engine, whereas Hyundai has plonked in the super smooth 1.6-litre CRDi unit. If spec sheet numbers matter to you a whole lot, the Creta will appeal instantly, with 128PS of power and 260Nm on tap. The Captur comes in second, with 110PS and 245Nm, whereas the S-Cross is a distant third with 90PS and 200Nm. And, the on-road numbers depict just that. The S-Cross is the slowest not only to the ton but also when you drop the hammer down in-gear. Most of that is down to the turbo-lag that the 1.3-litre engine brings with it. While it is better controlled here compared to other Maruti Suzuki cars that run this tune, it’s clear this motor isn’t meant for thrills. It’s thrifty and is better suited for no-nonsense point A to B commutes. The motor is now paired with Suzuki’s mild-hybrid SHVS tech, and that pays dividends by the bucket loads in city traffic. At 19.16kmpl, the S-Cross proved to be a whole lot more efficient compared to the Captur (15.5kmpl) and the Creta (13.99kmpl). It won’t tire you out inside the city either - the clutch is light, and so is the steering. The gears slot in with a smooth, slick action and there’s not much to frown about here. Ride quality too, is f-a-n-t-a-s-t-i-c. We’d go so far as to say that it’s the best in this company. It pummels imperfections on the road and keeps the cabin rock steady. It’s a calm commuter. No more, no less. On the flipside, the Captur can get on your nerves inside the city. The turbo-lag is a whole lot more prominent compared to the S-Cross, so you end up constantly battling the gear lever inside city traffic, sneaking in a downshift. The fact that the gear action isn’t smooth sailing, and that the clutch is heavy makes it a bit of a handful. As far as ride goes, it’s cushy and doesn’t let you feel much of the rough stuff either. But, it has a stiff edge to it that comes to the fore when you go over expansion joints or sharp-edged potholes at low speeds. Dial in its size, and it isn’t particularly happy on crowded metro roads. We’d have liked it had Renault tuned the Captur to be a bit more city-friendly. In fact, even something like the 85PS tune of the Duster would make it a tamer animal in the urban jungle. Speaking of the urban jungle, that’s where the Creta simply shines. Even when the turbo isn’t spooled up, it feels drivable - responding to light dabs on the throttle. When the turbo does kick in, it gives you one clean surge, not a sudden spike. So, inside the city, you won’t be caught off-guard by a sudden burst of torque. But, what really polishes off the experience for us, is the refinement levels. You won’t hear much of the engine inside the cabin unless you’re really wringing it. The suspension too keeps things nice and quiet. It doesn’t have a stiff edge like the Captur, nor does it feel cushy like the S-Cross. It’s somewhere in the acceptable middle-ground. You could, in all three. And, you’d find that all behave differently, yet again. The S-Cross for instance just doesn’t have much go-power to offer once your speedo has strayed into three digits. Even if you downshift and bury the pedal into the mat for a quick overtake, you aren’t really going to see much progress. It even sounds strained and gruff, and almost makes you question why you bothered pushing it. This one is happy chugging along for a calm cruise. There’s no nervous floaty feeling, or the steering going light or any of those unwanted surprises. The cabin remains as flat as you’d want it to. Renault’s Captur does one better. On the highway, it feels like an absolute rockstar, unfazed by anything the roads decide to throw at it. It’s the one that feels at ease chugging down the miles enthusiastically. Once you get past the lag and get the turbo spinning, the Captur can make you giggle. The torque pins you to your seat, and that can be quite fun. The urgency in how the torque kicks in also explains the quicker in-gear acceleration times. The heavy steering redeems itself here, and you’d appreciate the weight as you slice through expressway lanes. The Creta’s steering too feels steady at high speeds. And, unlike Hyundais of the past, it doesn’t bob and bounce about either. It rides flat for the most part unless you hit an undulation at high speeds. This is where the underlying comfort bias of the Creta comes to the fore. It doesn’t lose its composure per se but takes a while longer to settle down after you’ve hit a bump at high speed. These three are clearly meant for three different kinds of buyers. But, we do have an order of preference. At number three, is Renault’s Captur. It’s something that prioritizes form over function. While it’s an epic mile muncher, it fails to deliver a hassle-free drive experience inside the city (where it will be driven most of the time). Smaller bits like the iffy interior quality and the lack of room don’t help its case either. Where the other two don’t have a patch on it, includes the fact that it comes standard with a French flair. If making a statement is priority numero uno for you, and you’re willing to live with the quirks of the Captur, it is in fact, quite likeable. If you pick one, it’s going to be all heart. Coming in at number two is the Maruti Suzuki S-Cross. It’s the only one we’d call a five-seater, and the value proposition it brings to the table is fantastic. If you’ll be travelling inside the city most of the time, it’s practically a no-brainer. That ride quality, coupled with the efficiency should keep you plenty happy. Sure, it will struggle a bit on the highway, and it feels like it lacks the oomph that the other two have. The S-Cross for us is a heavily underrated crossover that appeals more to the head than the heart. And that brings us to number one. It’s the Creta then, that appeals to both the heart and the head. The heart, because it packs in all you could need, and then gets you the flashy bits such as the sunroof and the wearable key. The head, because it rides well, feels well-built inside out and delivers decent fuel economy too. Yes, it’s a whole lot more expensive and has some glaring misses like auto headlamps, rain-sensing wipers and the fact that ISOFIX is limited to the automatic variants. But, then again these won’t necessarily change your buying decision. So, you weigh in the pros and the cons, it does feel like money well spent. Bottom line, the Creta continues to be the best balance of needs and wants.